FOXBORO, Mass. 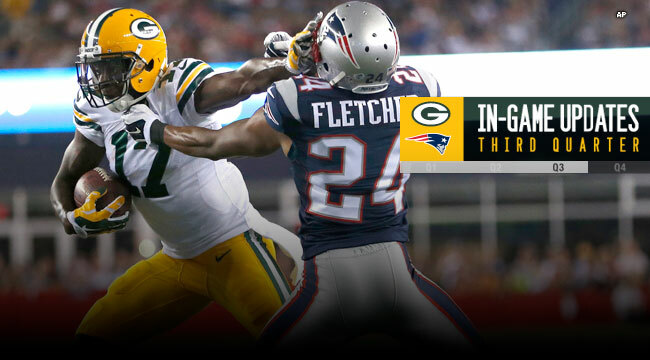 — The Packers took a 15-11 lead over the Patriots in the third quarter of Thursday’s game at Gillette Stadium. LaDarius Gunter made the splash play of the game when he intercepted a Jimmy Garappolo pass and returned it 28 yards. Two plays later, undrafted rookie Alonzo Harris ran 25 yards for a touchdown that put the Packers in the lead, 15-11. Gunter is an undrafted rookie from Miami (Fla.). He’s had starring moments in training camp. His play on Thursday night, along with second-round draft pick Quinten Rollins’ three passes-defensed in the second quarter, bode well for a Packers secondary attempting to replace cornerbacks Tramon Williams and Davon House, both of whom were lost in free agency. First-round draft pick Damarious Randall, another rookie cornerback, didn’t make the trip to New England due to a groin injury. The Packers defense held on a fourth-and-3 late in the third quarter to punctuate its strong play. Rookie quarterback Brett Hundley replaced Scott Tolzien with 6:36 to play in the quarter. A sack killed any chance of a successful drive.